Redlands, California—Esri, the global leader in spatial analytics, and DigitalGlobe today announced that they have created a Story Map of high-resolution imagery that visualizes the 12 venues being used for 2018 FIFA World Cup Russia, exclusive to The Associated Press. The World Cup is a major sports draw every four years, with over 3.2 billion people watching the 2014 FIFA World Cup. Even more remarkable is that this is the first time the event has taken place in Russia, and it’s the first time these images have been seen.The DigitalGlobe constellation of high-resolution satellites offers incredible accuracy, agility, and collection capacity, imaging more of the world in the finest level of detail. This constellation is unprecedented in the industry, enabling customers around the globe to get the highest quality view of their world. DigitalGlobe imagery is available through ArcGIS Living Atlas of the World, the foremost collection of geographic information from around the globe, which is included with all ArcGIS subscriptions. It is comprised of maps, apps, and data layers that support the work of thousands of Esri users around the world. 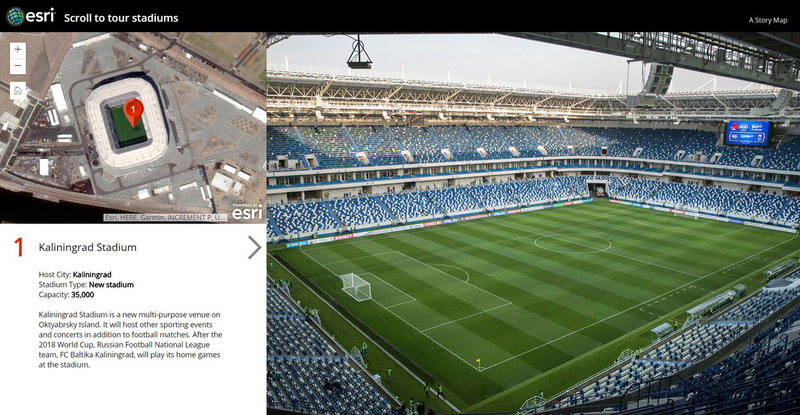 “DigitalGlobe is excited to provide Esri with this unrivaled visual clarity over the FIFA World Cup stadiums using the most advanced high-resolution satellite constellation,” said Chris Formeller, core content product manager for DigitalGlobe. Esri Story Maps apps help tell stories by combining authoritative maps like those from Living Atlas, images such as the DigitalGlobe imagery, narrative text and other content including videos, and more. Story maps can help viewers discover information through a guided experience that is more informative than simply providing pictures. For more information on ArcGIS Living Atlas, visit go.esri.com/WorldCup.